Make room in the trophy case. The Goldener Hirsch Inn and Goldener Hirsch Restaurant were once again both named AAA “Four-Diamond” destinations last month. 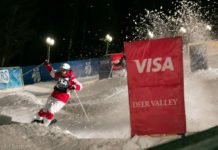 The awards, coming just a few weeks after Goldener Hirsch was named a “skier’s paradise” by VacationIdea.com, mark the sixth time the small luxury hotel at Deer Valley Resort was named a Four-Diamond lodge, and the 11th time it was named a AAA Four-Diamond restaurant. The Goldener Hirsch has attracted wide acclaim for its accommodations and personalized service since opening in 1991. It has earned “Extraordinary” ratings from the Zagat Survey and won repeated recognitions from Salt Lake Magazine and continuous Wine Spectator awards since 1995. 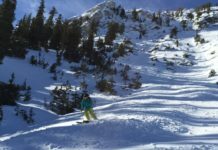 In January, the travel website VacationIdea.com named Goldener Hirsch a “Best City Inn in North America,” and the month before, the World Ski Awards named the inn the “Best Ski Boutique Hotel” in the US. The experience at Goldener Hirsch is one of a kind: Located high on the slopes above Park City and just steps from the ski runs of Deer Valley, the Goldener Hirsch plays home to a European environment in an unparalleled natural setting, featuring award-winning ski-in/ski-out luxury accommodations, personal five-star service, and a renowned full-service restaurant and lounge. The hotel’s 20 rooms feature European King-sized beds, hand-painted furnishings, fluffy terry-cloth robes and slippers, private balconies and wood-burning fireplaces. Guests can also enjoy the hotel’s hot tubs, a sauna and exercise equipment, and the Continental and American fare from its restaurant.